This project was shot in one evening—a total of four hours—with many collaborators and a mishmash of audio, lighting and camera equipment. The hustle and bustle on set had the buzz and energy of a film production, where everyone has a very specific job tailored to their expertise. In this industry, for increased efficiency and reduced budget, we often find ourselves wearing many different hats on a shoot. This was a unique opportunity to perform very specialized roles, as the credits acknowledge. Right away, it’s obvious that the setting of this story is gritty and minimal, and the last thing on the minds of our athletes is dropping the paddles and calling game. In the shadow of their highs, nothing else matters but the opponent across from them. 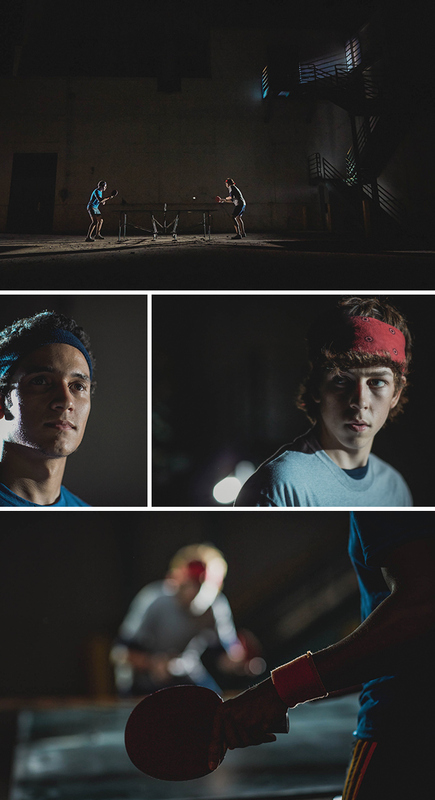 Dramatic lighting showcases the intense energy of the scene, the driving action behind the simple narrative of these two dedicated, semi-professional table tennis players. It ignites a fierce sense of competition between the two players—and a concentrated passion for the game. In the upcoming weeks, we’ll release another installment of our series Behind the Lens, featuring the production behind Head to Head. You’ll get an insider’s look at all the equipment, talent and techniques that made this shoot possible. On this project, and many others, we were lucky to work with some of Minneapolis’ top creatives. Every project we do is an opportunity to find and share stories as still images, film and the written word. It is a form we continue to embrace in our latest edition of the JCP Newsprint promo. In the ever-growing realm of digital communication, we've embraced the tactile, physical format of a newspaper as the perfect medium for exploring and sharing the content that we shoot. For this latest, third edition we collaborated with writer Carolyn Petrie to add a new layer of perspective to the design by Eight Hour Day. The copy expands on the images and ideas, complimenting both the visual form and printed medium. The journey of a project from ideation to content creation can be as unique and memorable as the final result. To share a bit of the journey with you, we’ve put together a short film that illustrates the complexity as well as visual intrigue of the promo printing process. Thanks to GLS Companies for both printing and allowing us to roam and visually document the process. From the JCP Team: Explore. Experience. Engage. And, embrace 2014. One player in a thick, red bandana jumps quietly in place, his arms swinging up and down at his sides. A tightly strung net, just longer than the width of the table, separates him from his opponent. Stories inspire connection. That’s the narrative of our work: Not just to capture the subject, scene or action, but to tell a story that is memorable, even familiar. There’s an innate challenge in capturing the intangibles of that story in a photograph—the unspoken dialog, the tension of the setting, the nuance of little shifts and changes in the scene. The more minimal the scene, the greater the challenge in capturing those nuances. This spec project for Adidas exemplified that raw minimalism. There’s no fancy backdrop, no audience. We see two players and a table, and between the three exists a tension—like a binding glue—that tells the underlying story. The players’ hands grasping the paddles. The stare of a competitor hunting for an edge. The snap of the wrist as they hit the ball for the first time. These are the unplanned elements that breathe life into a photo (and moving visuals, too) the little pieces we don’t expect but patiently allow them to be revealed. Every day, we challenge ourselves to push the boundaries of our experiences, our equipment and our comfort zones to deliver both the expected—and the unexpected. *This project was an in-depth exploration that tapped many local creative partners. Tonight, we’re looking forward to a cast/crew screening party to say thanks as well as raise a glass to the finished video edit. We look forward to sharing this video along with the accompanying Behind the Lens episode with you in coming weeks. My family and I have a tradition of hitting the road every other holiday season, south bound to relax amid warmer temps and to spend time with my wife’s family near Lafayette, Louisiana. This year’s three week, near 4,000 mile journey certainly had its share of visual highlights. While a few of these iPhone images made my instagram feed, I did my best to keep this trip about family and taking in life at a slightly slower pace. The South, specifically the route we took follows the Mississippi on down to New Orleans. 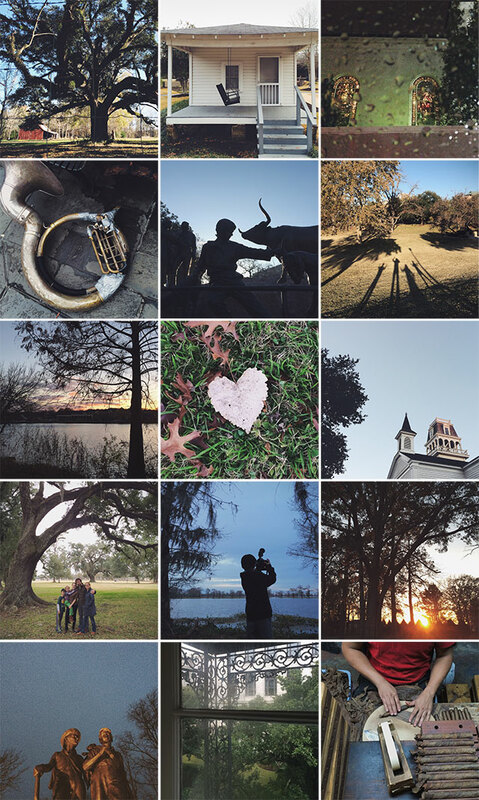 The collage is a map of sorts, offering a glimpse of time spent exploring places such as Hannibal, Missouri home of Mark Twain, and Tupelo, Mississippi to explore the childhood home of Elvis Presley. Further south we always carve out an extra day or two for New Orleans and the French Quarter - so much to see amid the winding streets, colonial architecture, and seemingly endless energy. Our final drive took us two hours east of The Big Easy to our destination city of Grand Coteau which lies in the heart of Cajun Country. After about a week with extended family and holiday celebration we set off west for Austin, Texas for the final leg of our trip. It was quite an amazing experience all around as this was our first time in Austin as a family; enjoying the people, sights, food, and certainly the weather. In addition to roaming the city in all directions, I managed to carve out time to shoot a couple of personal projects that I look forward to sharing in days ahead. Both subjects were small businesses that are thriving on trades of the past, one a taxidermist and the other a shop that specializes in custom denim apparel. Here’s to the New Year and continued adventure that life brings to all of us who spend time in and around the presence of a camera. I can’t thank all of our supporting partners enough including clients, crew, and of course the subjects who let us into their lives and ultimately make all of this possible.